Pleasant spring weather gives way to heavy spring rain and a few strong thunderstorms as March goes out like a lion! Already with a foot of rain for the month (12.01"), Memphis International Airport has recorded its fourth wettest March on record. If the forecast amount of rainfall occurs in the next 48 hours, March 2016 will be the wettest on record, eclipsing the current "high water mark" of 13.04" set in 1927. Let's get into the details. High pressure that has been controlling our weather for a few days moves east of the region tonight, turning our wind to a southerly direction tomorrow as "double barrel" low pressure forms in the Plains, with one center of the low in Nebraska and another moving east across north Texas over the next 24 hours. That will setup a scenario in which abundant moisture will be pulled north from the Gulf of Mexico on a developing low level jet stream (in the lowest 2000-5000' of the atmosphere) and increasingly gusty southerly surface wind. With plenty of moisture in place, upper level disturbances that move through the area ahead of the low pressure systems will help to initiate and focus rain and thunderstorms across the region. The surface setup at mid-day Wednesday shows the double lows over the Plains and widespread rain and thunderstorms ahead of the system, including over the Mid-South. This process will begin tomorrow with rain and some thunderstorms breaking out over the area, as well as moving in from the southwest, mainly during the afternoon hours. However, the focus of one of these upper level disturbances will be moving out of the ArkLaMiss region east into north MS Wednesday evening into Wednesday night, resulting in heavy rainfall and the threat of a few strong storms. In fact, the heaviest rain over the next couple of days is expected Wednesday night. 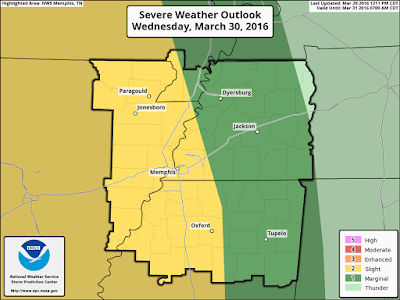 A Slight Risk of severe weather (yellow, category 2/5) covers most of the metro for Wednesday and Wednesday night. Once the main disturbance passes by to our east late Wednesday night, there will not be as strong of a focus for rain and storms heading into early Thursday. However, with the lows still to our west and their cold front approaching, we will still be in the "warm sector" of the storm system with southerly wind flow over the area. With less widespread rain, instability will increase markedly Thursday as temperatures warm well into the 70s and dewpoints (a measure of near-surface moisture) will rise into the 60s. This combination of ingredients will mean the threat of storms remains possible, particularly as the cold front itself approaches late Thursday. The index typically most widely used to measure instability is CAPE, or Convective Available Potential Energy - energy in the atmosphere that is "available" to produce convection, or thunderstorms. 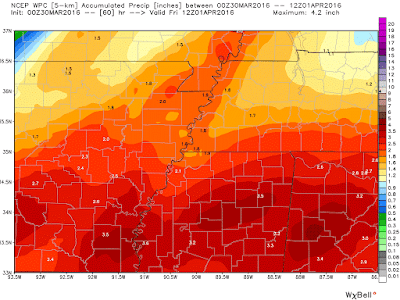 The graphic below shows forecast CAPE values for Memphis from a series of model runs called an ensemble. 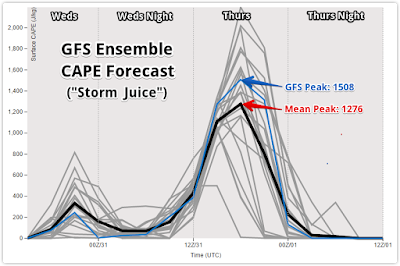 A model "ensemble" means that the model was run numerous times with small "tweaks" to the way the model is run. 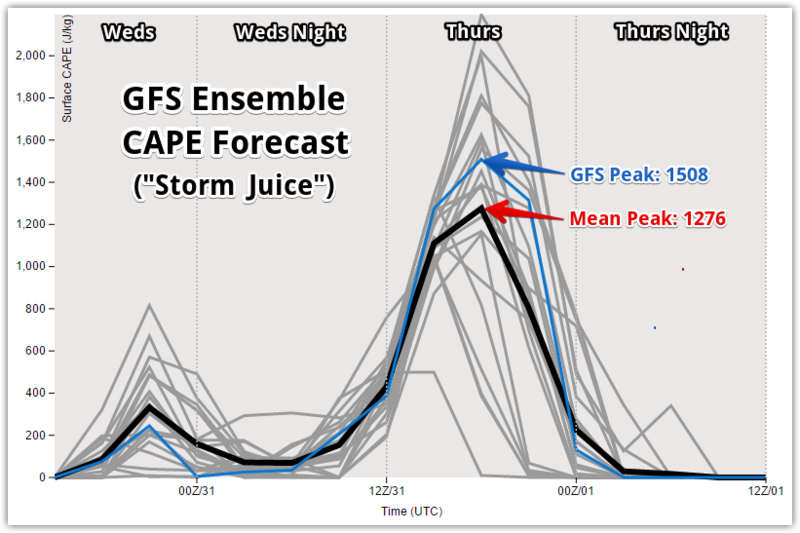 In this case, the GFS model was run numerous times and the graphic displays the Convective Available Potential Energy (CAPE) values for Memphis for Wednesday and Thursday from each of those model runs. CAPE is a measure of instability of "storm fuel". Values of 200-300 J/kg on Wednesday are sufficient for thunderstorms, but values of 1200-1500 J/kg on Thursday afternoon are more supportive of strong storms. Though we expect less overall rain Thursday than Wednesday night, storms are expected to be scattered to numerous, and stronger (due to higher CAPE), especially mid-day through the afternoon. Though SPC only has the metro in a Marginal Risk (category 1/5) for Thursday as of this post, I wouldn't be surprised to see that raised tomorrow or Thursday if current forecast conditions remain favorable. By late Thursday (late afternoon or early evening), the cold front will pass through and our rain and thunderstorm chances will end, beginning an extended period of dry and cooler, but seasonal, weather heading into the weekend. As for the heavy rain threat, the greatest threat over the region, with particular emphasis on north Mississippi, is Wednesday after dark. On Thursday, very heavy rainfall will also be possible in localized areas under storms, but the threat won't be as widespread. 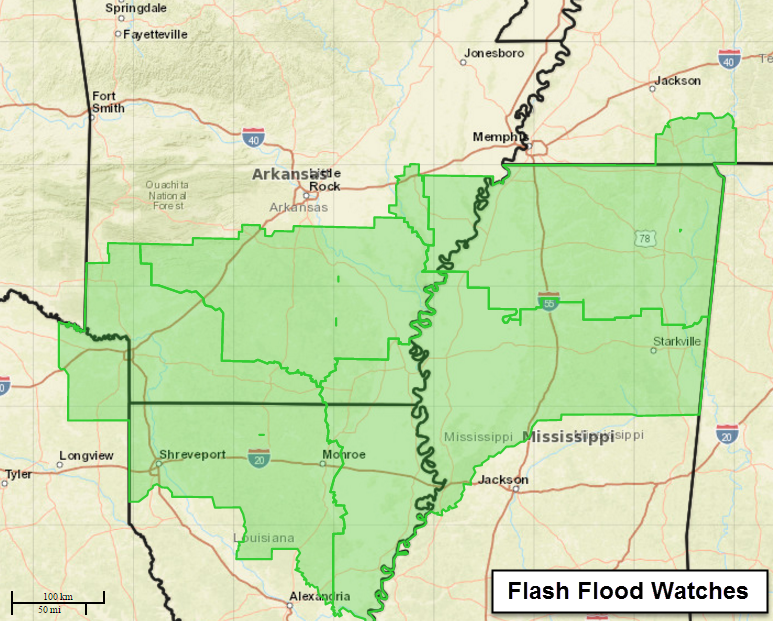 Flash Flood Watches are in effect for all of north MS from Wednesday afternoon through Thursday (see graphic below). 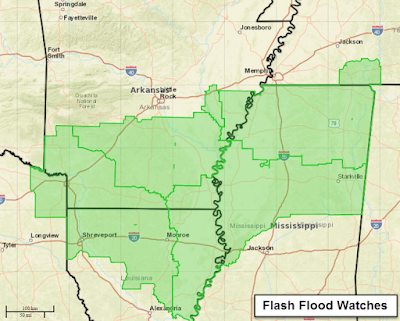 Flash Flood Watches are in effect for a large area south of Memphis through Thursday. Total rainfall amounts will likely be well over an inch in most areas of the region with 2-4" amounts likely in north MS. Below are model simulations of total rainfall for Memphis, as well as the NOAA precipitation forecast for the Mid-South. 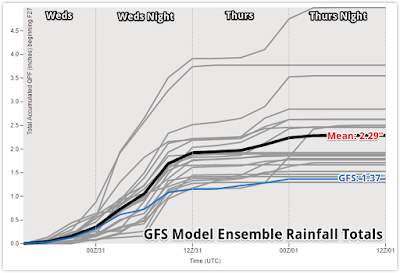 Another look at the GFS Ensemble model data (similar to above), only this time for total rainfall. 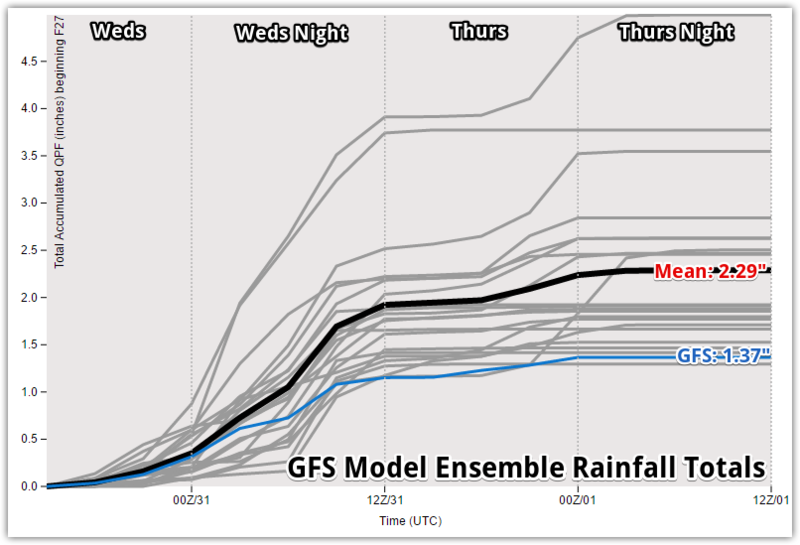 You'll notice that the mean, or average of all of the models, is about 2 1/4" of rain in Memphis, while the primary GFS model is indicating about an inch less than that. The range of values provided gives an idea of the range of scenarios possible. A "clustering" of data values provides higher forecaster confidence in a given scenario. In this case, most scenarios indicate 1.5-2.5" of rain. NOAA's Weather Prediction Center forecast rainfall amounts through Friday morning. Graphic courtesy WxBell. Keep the umbrella handy the next couple of days, but be thankful that we'll get a good pollen-washing rain! 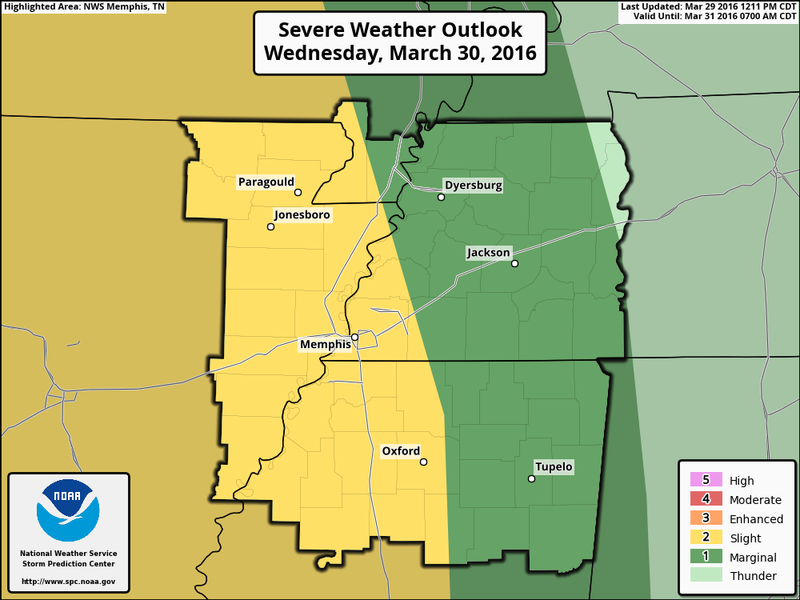 And keep a close eye on the MWN Forecast and severe weather updates the next couple of days in case strong storms develop and move towards the Memphis metro. Meet StormWatch+, your NEW national weather app! First week of spring - snow, then warmer!